Tenchi Muyo takes place in modern day Japan. The story follows a young boy named Tenchi who lives with his father and grandfather in a house by their family's shrine. One day, Tenchi accidentaly releases a demon trpped inside of the shrine. The demon(Ryoko), having watched young Tenchi grow up from the cave, had a certain fondness for the boy but that didn't stop her from chasing him around his school and practically destroying Tenchi's school in the process. Tenchi finally figures out that the three jewels that Ryoko wears are the source of her power. Tenchi uses the sword hilt he had found in the cave to take Ryoko's gems and prevent her from causing more chaos. Meanwhile, Crown Princess Ayeka has come to Earth in search of her fiancee Yosho. Also on her way to Earth is Galaxy Police Officer Mihoshi. She has been tracking a criminal known as Kagato that may have entered our solar system. A whole mess ensues and they all end up living at Tenchi's house waiting for a ride home. In the meantime, Tenchi finds himself surrounded by girls that all are seriously interested in him. Look out Tenchi! Tenchi Universe is based on the same characters but adds Kiyone to the story as a balance to Mihoshi's ditzness. The story starts out differently also. Instead of being a demon, Ryoko is only a space pirate that crash landed on Earth while being chased by Ayeka and her sister Sasami. Mihoshi was also involved with trying to arrest Ryoko. Instead of being Kagato's prisoner, Washu lands on Earth in a stasis pod where she had been trapped for 700 years. Kiyone comes later after being sent to Earth to retrive Mihoshi and the Princesses. Tenchi in Tokyo uses the same characters as Tenchi Universe. Although the story about how they met changes yet again. Now Ayeka, Sasami, Mihoshi and Kiyone are chasing the space pirates Ryoko and Washu. Ryoko and Washu stole a Jurai crystal filled with Jurai energy. Ryoko had to land their ship on Earth in search of power strong enough to refuel their ship. Washu located a power nearby and surprise, it's centered around Tenchi. Ayeka and Sasami land on Earth to hunt down Ryoko, so Mihoshi and Kiyone do the same. 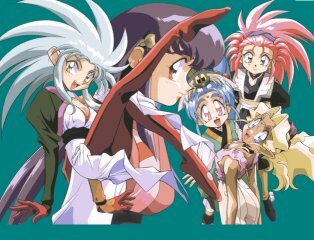 Tenchi Muyo is an excellent additional to the harem anime shows. Unlike Oh My Goddess, the girls are less submissive and more believable as they all have their own agendas. 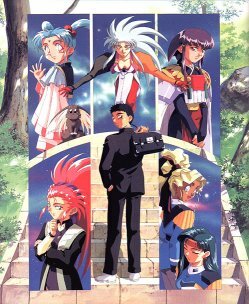 The dvd is basic with no real improvement over VHS quality, there are a few extra scenes that were cut or censored in the Cartoon Network version, but overall Tenchi Muyo is a good feel good innocent[ish] anime.